The S’mores flavor components—chocolate, graham crackers, and marshmallows—lend themselves to a wide variety of candies. In S’mores Fudge these three tastes are combined in small chocolate squares that have a pleasant graham flavor and crunch, along with a hint of gooey marshmallow. Prepare a 9x9 pan by lining it with aluminum foil and spraying the foil with nonstick cooking spray. Coarsely chop the graham crackers into small pieces and set aside for now. In a large microwave-safe bowl, combine the chocolate chips, condensed milk, and butter. Microwave for one minute, then stir well. If the chips and butter are not fully melted, microwave in 30-second increments, stirring after every 30 seconds. Stir to ensure all the chocolate is melted, then add the vanilla and salt. Stir until the candy is smooth and well-mixed. Add 1 cup of the miniature marshmallows and all but a few spoonfuls of the chopped graham crackers. 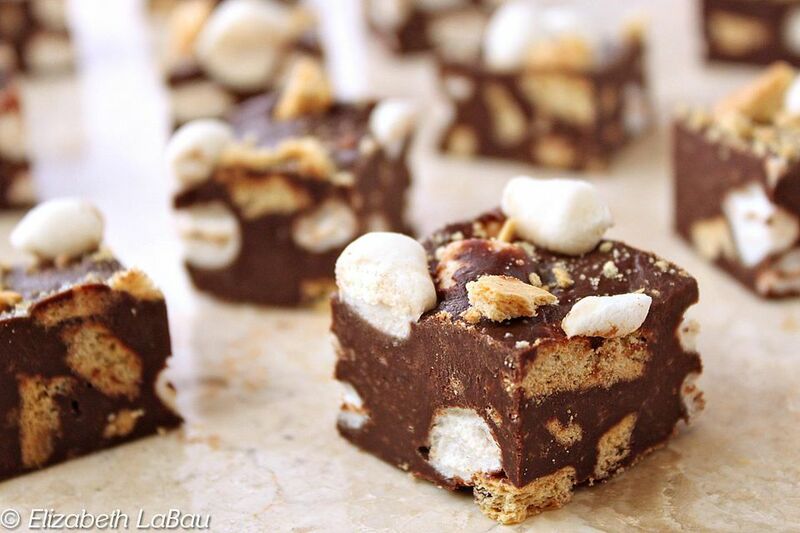 Stir the marshmallows and crackers into the fudge until they're well-mixed. Sprinkle the remaining marshmallows and crushed crackers on top of the fudge, and press down gently to adhere them to the top. Place the fudge in the refrigerator to set for at least 2 hours. Once set, cut into 1-inch squares and serve at room temperature. S'mores Fudge can be stored in an airtight container in the refrigerator for up to two weeks. For the best taste and texture, bring to room temperature before serving. Click Here to View All S'mores Recipes!